Charles William Reeves was born in East Oxford in 1890, the son of William Joseph Reeves (born in St Clement’s, Oxford near the beginning of 1858) and Mary Hawes (born in St Ebbe’s, Oxford in c.1868). By the time of the 1901 census, they had six surviving children: Charles (12), William (11), Florence (9), Albert (7), Ethel (3), and Harry (1), and still found room for another lodger. By 1915 Charles was working as a motor driver. 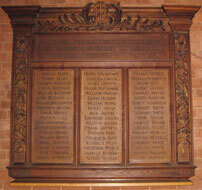 ♥ On 27 August 1911 at St Andrew’s Church, Old Headington, Charles William Reeves (21) married Laura Jane Cooper (23). She was born in Headington and baptised at St Andrew’s Church on 29 April 1888, and was the daughter of the late William Cooper, a labourer. At the time of her marriage she was living in The Croft in Old Headington. Alice Maud Reeves (born in Lime Walk on 20 December 1913 and baptised at St Andrew’s Church on 8 February 1914). 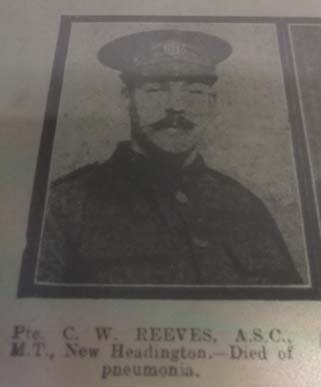 In the First World War Charles Reeves volunteered to serve, signing up on 27 October 1915. He served as a Private in the 1st Water Tank Company of the Army Service Corps (Service No. DM2/135507), where he was probably able to use his driving skills. He caught pneumonia in France and died in Rouen at the age of 28 four days after the armistice on 15 November 1918, presumably at the hospital there. He was buried in the St Sever Cemetery extension, Rouen (S.III.V.19), and is remembered on the Roll of Honour of All Saints’ Church, Highfield. Mrs Laura Reeves remained at the present 14 Lime Walk (then numbered 18) until at least 1936. Alice Maud Reeves (born 1913) is probably the Alice M. Reeves who married Harry G. Jones in the Oxford registration district in the second quarter of 1938. Florence Agnes Mary Reeves (born 1892) married Ernest F. Walton in the Headington registration district (probably at All Saints’ Church) in the fourth quarter of 1921. Albert George Reeves (born 1894) married Elsie Annie Hazell in the Headington registration district in the first quarter of 1931. Their son Edward George Reeves was born on 24 December 1935 and baptised at St Andrew’s Church on 1 March 1936. They were then living at 104 Coniston Avenue, Headington.